I am going to do a pros and cons list for these today. It just works. Let’s get into the review, shall we? They’re a wee bit crumbly. Not a deal breaker by any means. I’d highly recommend these. They’d be perfect for birthday or dinner parties, bible study snacks, school lunches, dessert with dinner, or just a general snack throughout your day. They would not be great rolled out into shapes, but the decorating options with colored sugars/gluten free jimmies or topping with your favorite gluten free frosting are endless. I’m not saying y’all need to go right out today and try these, but I’d highly suggest it! 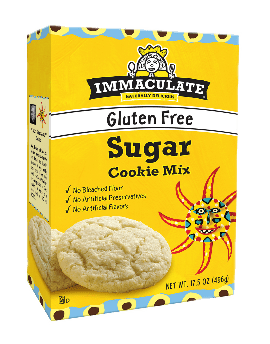 If y’all are in the market for a Gluten Free Sugar Cookie Mix soon, this would certainly be the mix I would recommend. Hope y’all have a WONDERFUL day! I am going to go find out if my mom snagged the last of our sugar cookies.